Vincent Vozzella – son of John Vozzella, Assistant Treasurer with High Company LLC. Vincent graduated from Penn Manor High School where he participated in Football, Track and Field, and Swimming all four years, and was Senior Captain of the Swimming Team. Vincent was a member of National Honor Society his Junior and Senior years, serving as Vice President his Junior year and President his Senior year. In addition, Vincent served as an Altar Server at St. Philip’s Church, coached Junior Comet Flag Football, and coached the 4th Grade Math Bowl. Vincent plans to pursue a degree in Psychology/Economics from the University of Pittsburgh. Theodora Dillman – daughter of Brad Dillman, Vice President – Engineering with High Steel Structures LLC. 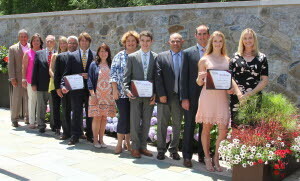 Theodora graduated from Conestoga Valley High School where she participated at the highest level in Field Hockey, including First Team All-State in PA her Sophomore, Junior, and Senior years, Regional All-American (second team) her Senior year, and was named National Field Hockey Coaches Association Academic All-American Scholar of Distinction her Junior and Senior years. She served as Varsity Team Captain her Junior and Senior years and received the Linda Shelley Spirit Award in 2017, as well as many more accolades while attending the USA Field Hockey camps and tournaments and X-Caliber Club Team events and competitions. In addition, she was a member of the National Honor Society, the National Art Honor Society, and Student Council. Her community service included Readers Helping Readers, where she served as Founding Officer and President, and English as a Second Language classes. Theodora plans to pursue a degree in English Language and Literature from Yale University. David Medlock – son of Ronnie Medlock, Vice President – Technical Services with High Steel Structures LLC. David graduated from Lampeter-Strasburg High School where he participated in Marching Band, Concert Band and Orchestra, serving as Senior Section Leader in Marching Band. He was a member of National Honor Society his Junior and Senior years. In addition, David volunteered with the L-S Community Closet, the Lampeter Fair, and the Lancaster Science Factory. David plans to pursue a degree in Engineering from Rensselaer Polytechnic Institute. High Foundation is a non-profit organization that was established by members of the High Family. The Foundation’s overall mission is to give back to the community by providing support to non-profit organizations in communities in which the High® companies do business and assist High co-workers in meeting the costs of a college education for their children through the High Foundation Scholarship Program.